There are many ways to attract people's attention to Wirtland. Recognition is one of them. It sounds official, but in fact you do not need to be General Secretary of United Nations, or a president of some country, to recognize Wirtland. There is a very simple way to recognize our country. Almost every webmaster and owner of internet resource can do that. 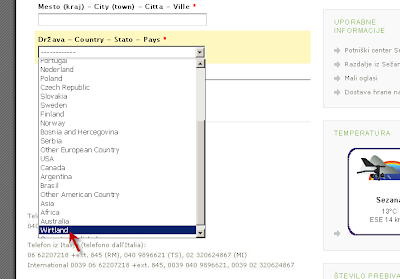 When you register yourself at various internet services, you often need to select your country from a drop-down list. So, I am talking about inclusion of Wirtland into such drop-down country list. This can be done very easily by a small change in the coding. Some websites have done that already for Wirtland. The latest example is Slovenian resource (see picture). For Wirtland, this is important. And for the websites this is useful, too, because of marketing effect. "Our site recognizes virtual country" - is a slogan which helps to stand out, and may draw new clients. So, a small change in coding is well worth the effort. Do you speak Farsi? The Farsi version of Wikipedia now has an article on Wirtland. 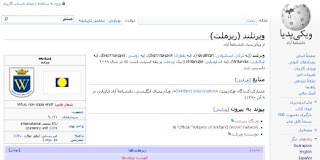 Farsi, or Iranian, has become the 9th language in which Wikipedia articles on Wirtland are available. Wikipedia's coverage of Wirtland is growing steadily. The first article on Wirtland appeared in Bulgarian Wiki, soon followed by English, Spanish, Russian and other language versions. The November issue of Russian newspaper F5 features a large article about Wirtland. F5 is a full-colour printed weekly focusing on Russian-language internet. 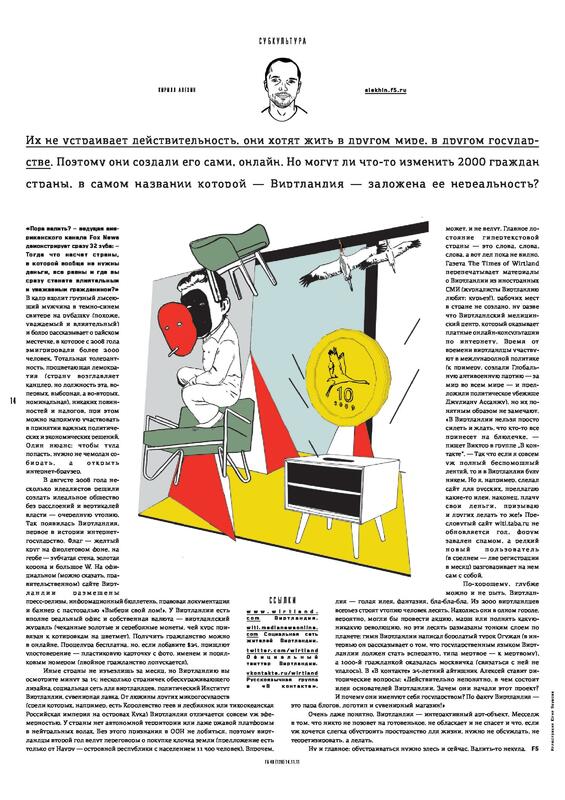 One-page article by Kirill Alekhin from newspaper's Subculture Section starts with phrase: "They are not satisfied with reality, they want to live in another world, in a different state...". Here are the links to full text of article in PDF and in JPG. Plain-text version can be found here. Comments by Russian-reading witizens are welcome! Citizens of Wirtland opened a business, which seems a logical choice for cybercountry: re-selling web hosting. 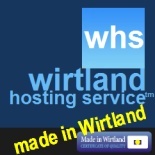 Wirtland Hosting Service (WHS) is a company registered in Wirtland. As one of official businesses of Wirtland, WHS bears the Wirtland Quality Certificate. The new site can be found here. Today Wirtland appeared in television news broadcast in Slovenia. This is the video from today's news on Sponka television channel, covering Wirtland. The text can be found at Novice: Sponka TV. Wirtland greets all Slovenian-speaking people, and today Slovenian Club was opened at Wirtland.net. Slovenia is the third country of the world which covered Wirtland in television news. In the past, American FOX News broadcasted the interview with Larry Fiorino on Wirtland (see clip here) and Bulgarian National BTV Channel organized a live interview with several witizens (see clip here). 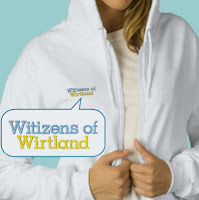 An elegant way to demonstrate your Witizen identity is wearing Wirtland's merchandise. Apart from traditional T-shirts and mugs, our two online shops offer a choice of items for winter season. Quality embroidery adds a touch of style to items such as lady's bags, polo shirts or winter pullovers. As always, you may customize your item by adding your own text, changing color and style. Check other items in Witizen Gift Company and Wirtland Design. And your new designs and ideas are always welcome! Wirtland aims to be useful to citizens. This is the cornerstone of our concept of a state. The country must constantly improve the life of citizens, make it more convenient, and create new opportunities of income generation for them. 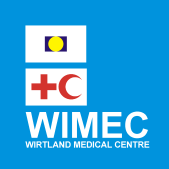 For users WIMEC is a unique service, where people can find the needed online medical consultant, who speaks their language. Consultation is done online through Skype call or video call. Users can rate the quality of consultations. For medical professionals WIMEC is an income-generating opportunity. Doctors give professional consultations, earning consultancy fees which they choose themselves, paid through Skype Prime. If you are a certified doctor, and you want to offer your services for WIMEC, you may add your listing here. You do not need to be necessarily a citizen of Wirtland. WIMEC is not a commercial project: Wirtland will not charge doctors any fee for listing at WIMEC. Medical specialists will not pay commission from earned professional fees. WIMEC is not involved in the pricing policies of the doctors - they set up their fees independently. The first introductory call to the specialist is always FREE of charge. WIMEC service is open to everybody (not just witizens). The users are encouraged to send their feedback with reviews of quality of consultations which they received. Doctors from all over the world are welcome to join WIMEC listing. Wirtland also opened WIMEC Group at for professionals. Internet-based country of Wirtland announced partnership with AgilityHoster, which became the official web hosting provider or world’s largest cybercountry. 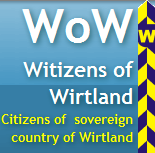 October 16, 2011 – Wirtland and AgilityHoster have entered into an alliance that is set to boost “Witizens of Wirtland” (WoW) – the fast-growing social network of Wirtland’s citizens – and to deliver top-level services to its global members. “Partnership with a reliable, modern internet service company is a backbone of an innovative web project such as Wirtland. We hope cooperation with AgilityHoster will be long-lasting and mutually rewarding”, - said the head of state of Wirtland. “After 3 years of constant growth, our project has become ripe enough to have it own social platform, independent from commercial network providers, free for all members, and free from advertising”. The all-new WoW network can be found at usual unchanged address www.wirtland.net. President & CEO of AgilityHoster said: “It was about time people to start associating the Internet as a virtual land and participating in virtual countries. We at Agilityhoster.com praise the freedom on the Internet and this is the reason we provide free web hosting services for all that want to upload web pages or website. Speaking for freedom and choice online we find so many similarities with Wirtland project. This is a new one unique and very exciting project of the modern and free minded people”. To better protect personal data of citizens, the new WoW Network does not import automatically all nearly 2000 members from Wirtland’s old network. Instead, the existing members are encouraged to register new profiles. Founded in 2008, Wirtland represents people from all five continents. Wirtland issues plastic ID cards, mints its own gold and silver coins. Wirtland's population is around 2,000. In 2010 Wirtland established The Wirtland Institute (www.wirtland.org) as a center for research and professional dialogue in the area of new forms of statehood. Wirtland (www.Wirtland.com) is the first internet-based sovereign state, an experiment into legitimacy and self-sustainability of a country without its own soil. Wirtland was founded on August 14, 2008 as a public initiative. Its population is currently approximately 2000 citizens from all five continents. It is represented through its official website http://www.Wirtland.com, its social network http://www.Wirtland.net, and “The Times of Wirtland” at http://wirtland.blogspot.com. Agilityhoster (www.agilityhoster.com) is fast growing free web hosting services company based in Germany. We aim to provide free web hosting services to all that need stable service in no or low cost, however in the same time offer professional hosting solutions for businesses individuals and anybody that has demand for quality shared hosting, semi-dedicated servers or Virtual Private Servers. Finally, a brand-new and fully independent social network platform for Wirtland! Finally, Wirtland is on the way to get its own platform for social network. From beginning, Witizens of Wirtland Network (W.o.W. Network) was based on Ning platform, later migrated to Grou.ps. The quality and reliability of commercial hosting providers was often insufficient. And they were becoming increasingly greedy. Ning, and later Grou.ps demanded that Wirtland upgrades to more expensive service plans, since our membership was growing every day. But Wirtland's policy is unchanged: citizenship of Wirtland will always remain free, and there will be no obligatory membership fees! There were many discussions about necessity of creation of an independent platform for WoW Network, which finally are leading to a concrete achievement. The first independent network is now open for membership and testing at http://witi.medianewsonline.com. It's yet in beta testing stage, but its functionality is extending every day. The good thing is that it's completely free from any non-Wirtland branding or advertising. With time, all the content will migrate from old network to the new one. But this process is not automatic, and migration of 2000 member profiles by hand is a very complicated process. Therefore, we are encouraging every witizen to register himself/herself at the new network. We are also asking to consider voluntary donations to Wirtland (of $10 or above), to help us cover the costs of migration and new network setup. This is completely voluntary, non-obligatory support. Our Donations page is here. The new network is based on customized version of BuddyPress software. The hosting provider is Wirtland's long-time partner Agilityhoster. Comments and suggestions from users will be appreciated. Feedback from programmers, designers, and other professionals interested in helping the project is also welcome. 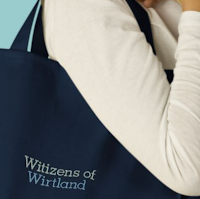 Wirtland's old and new citizens are welcome at new site!